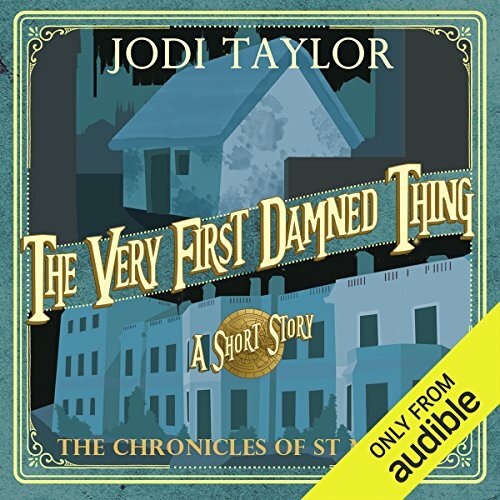 Audible is delighted to bring you an exclusive, author-read production of The Very First Damned Thing. Hear it here first, months ahead of the EBook publication. Jodi Taylor reads the long-awaited prequel in her Chronicles of St Mary’s series, as Dr Bairstow struggles to set up St Mary’s as we know it in a world still scarred by the ravages of civil war. Ever wondered how it all began? It’s two years since the final victory at the Battersea Barricades. The fighting might be finished, but for Dr Bairstow, just now setting up St Mary’s, the struggle is only beginning. How will he assemble his team? From where will his funding come? How can he overcome the massed ranks of the Society for the Protection of Historical Buildings? How do stolen furniture, a practical demonstration at the Stirrup Charge at Waterloo, students’ alcohol-ridden urine, a widowed urban guerrilla, a young man wearing exciting knitwear and four naked security guards all combine to become the St Mary’s of the future?